A couple of weeks ago, I made a post about Planned Parenthood selling the body parts of the dead babies it murders. Well now, there is a new controversy over a dentist killing a supposedly protected lion named Cecil. This has sparked rage among many people, and the sick thing is, many people who are angry about Cecil being killed, are the same people who support Planned Parenthood and defend them in spite of their bloodiness. That is what the main idea of this post will be about. Dead baby parts are going to the black market from Planned Parenthood, and the leftists hardly bat an eye but when some lion gets killed, they are calling for extradition and jail tim of the man who killed it. I am against how the lion was killed, but they way unborn babies are killed is worse. 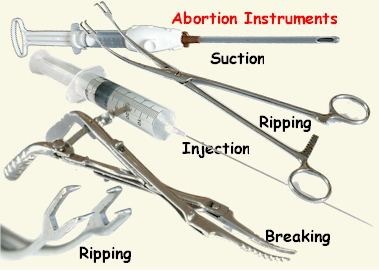 Look at the tools they use below. What should sicken you is that people are putting the lives of a wild animal over the life of a helpless innocent baby. I trust there are pro choice “Christians” (Presbyterians, Episcopalians, and other liberal denominations) who are against Cecil being killed. Let us debunk them in the light of Scripture. Genesis 1:26- And God said, Let us make man in our image, after our likeness: and let them have dominion over the fish of the sea, and over the fowl of the air, and over the cattle, and over all the earth, and over every creeping thing that creepeth upon the earth. You see that, mankind has dominion over all creatures that are non human. You animal rights Christians need some light shed on you. With us getting closer and closer to the end times, you will see mankind practicing the opposite of God’s word like you see above. They have completely turned the dominionship of humans over animals around. In the name of The Lord Jesus Christ I write unto you. Amen. Next Entry What is the Gap Theory and is it Biblical?